TFSFF is a short film festival established by the TriForce Creative Network in 2012 to showcase talent in contemporary film-making, helping emerging film-makers to develop skills and access opportunities to further their careers. With a focus on recognising and supporting diverse talent, the festival brings together film-makers with the movers and shakers in the industry, enabling emerging artists to break into the mainstream. 16 shortlisted films get the chance to be seen on the big screen, in front of key industry representatives, with the winning film-makers earning career development opportunities with our industry partners, as well as a cash prize for their next project. The TFSFF takes place at BAFTA, presenting a packed day of seminars tackling the key issues of the industry and offering invaluable advice from industry professionals, alongside a bustling industry expo and screenings of the shortlisted films. Concluding with a red carpet gala evening attended by high profile supporters, the TFSFF is the place to see untapped and diverse talent, showcasing innovative story-telling and visually stunning short films. Films must be between 5 and 20 minutes long, including credits. 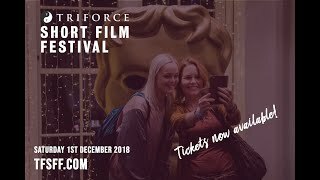 Tickets now on sale for TriForce Short Film Festival 2018!